Let me first say that I'm a bit skeptical about the long-term prospects of the Darfur truce. I'm mostly not clear that the Justice and Equality Movement (JEM) and other groups in Darfur will be able to reach a sufficient common understanding that they can successfully negotiate with Khartoum as a united front. 1) The Chadians are backing off. Khartoum regulars have seized sufficient ground in Darfur that Chadian action in the area is becoming more futile (and ultimately detrimental). Because of this, Chad declared an end to its proxy war with Sudan in the area, accepting a minor political defeat and retrenching in its own country. Without Chadian support, Darfurian rebels have a newly-diminished bargaining position. Sensing a potentially closing window of opportunity, Khartoum hopes to enter negotiations with the Darfurian rebels at their weakest, in order to end the war with the best-possible negotiated settlement (maximizing Khartoum's power in the area and over the country as a whole in the long-term). Such a favorably-settled peace will also boost al-Bashir's popularity, helping him secure victory in the next election. 2) Khartoum's priorities have shifted to Southern Sudan. Two big issues are coming up in Southern Sudan--the 2011 referendum on independence for Southern Sudan, and the decision on Abyei. If the referendum goes through, Southern Sudan would become an independent state (and given the current political organization proposed in the referendum, it would lead to massive political tension and possibly war). Khartoum wants its military forces to move south to be able to prepare for and deal with the fallout of an independence movement which has a great deal of popularity in the south. Furthermore, the region of Abyei is currently in dispute over where the north/south border lies. In particular, the dispute is over the location of the border with respect to a massive oil well that would either become northern or southern given its resolution (even if Southern Sudan remains part of Sudan, Khartoum ends up with more of the oil wealth than it would otherwise if the Abyei oil fields are located in the north). For Khartoum, a great deal of resource wealth is at stake in the south, where Darfur's threat is greatly diminished by Khartoum's relative control over the region. Khartoum is ultimately moving on from the Darfur war because it largely won its political objectives and now has higher priorities in its path to political and economic consolidation. The takeaway here is that realpolitik still dominates action in the geopolitical sphere, despite the best intentions of the most powerful nations of the world. It's an important lesson to take away as we (the liberal West) continue to try to craft the world in our image. A recent Gallup Poll shows 60% of Americans think Iran is a "critical" threat to US interests, and that only 23% perceive Russia to be so. Although I'm not surprised, it raises for me serious concerns about whether the United States is going to sufficiently keep Russia on its radar. While Iran has the potential to be a major irritant in Israel and exert major influence in Iraq, but Iran's ability to seriously threaten the United States in the long term is ultimately limited. The politicians that the United States elects will ultimately at least rhetorically follow the broad strokes of public opinion. That should speak for itself. Given that, will we elect leaders that "know better" than we do, and will keep Russia near the tops of their lists and simply try to play a rhetorical game elsewhere, or will we actually elect leaders that share our priorities on foreign policy? The thought is not terribly reassuring either way. After much hype and flailing about, the whirls of motion of the US military and executive seem to be coalescing into an unexpected elegance: an Afghan Strategy. What do we see going on? First, we see the Marjah offensive. Arguably the last major stronghold of the Afghan Taliban in Helmand, Marjah had the potential to be quite tough. Because NATO telegraphed this offensive for months (this is not necessarily a criticism), the Taliban had time to really hunker down and fill Marjah with IED's to punish the invaders. Such preparations not only meant that the battlefield was heavily boobytrapped, but also that most civilians were too afraid to leave the area. But US forces have performed brilliantly so far. 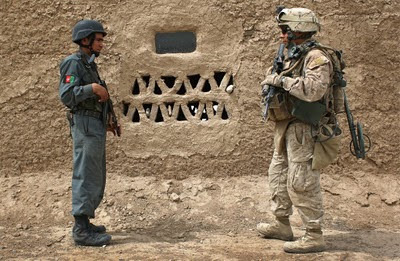 Special forces were dropped into the center and south of the town, disrupting Taliban coordination, potentially damaging its local leadership, and preventing planned escape routes from being easily accessed. All reports thus far suggest this move had helped to scatter and frustrate resistance in the town, and the primary Marine thrust from the north has faced only sporadic fighting. Enemy sniper teams continue to be an issue for slow-moving bodies of troops trying to clear IEDs, but Marjah appears that it will be a decisive success with minimal NATO/Afghan Army/civilian casualties. We see also that "decapitation" efforts in Northwest Pakistan are occuring with a startling effectiveness (especially compared to the last 8-and-some years). Drone attacks have increased in frequency, as have reports of the deaths of key Pakistani Taliban leadership. Mullah Omar's second in command has been captured by (what is actually being publicly announced as) a joint US-Pakistani intelligence operation. There is one likely explanation for the sudden success: increased intelligence sharing and cooperation between Pakistan and the US. Third, we see a flurry of diplomatic activity around Pakistan, as well as policy changes within. CENTCOM Commander General Petraeus and his primary contact in the Pakistani military have reported that they have achieved agreement on how to deal with the Taliban, which is an incredible step forward--until just recently, major disagreements between the US and Pakistanis on just how to deal with the Taliban (and which elements of the Taliban should be stakeholders versus targets) have prevented serious cooperation. Pakistan and the US seem to have finally been able to reach a deal. It is almost certainly not a perfect deal for both sides, but the Taliban have, over the past few years, been able to make life painful enough for the leadership of both countries that some perspective on what elements of a Taliban strategy are truly crucial (and which are negotiable) for both countries has likely emerged. Following this, we've seen high(ish)-level talks between Pakistan and India concerning arms reductions on their mutual border are occurring, which is quite an impressive leap. Not only are India and Pakistan in a relatively mutually-disagreeable geopolitical position with respect to each other, but they have been competing in Afghanistan for influence since the Taliban was ousted--the idea that they could be reaching a relative steady state in which they're able to take pressure off each other (important in particular so that Pakistan can move troops from its Indian border to relieve and support troops in the northwest) suggests a deeper understanding over a higher mutual interest that, as of yet, has escaped me. But indeed, these sudden cooperations and agreements (where for years I have thrown around words like "hopeless" about the thought of such agreement) indicates either a change in perspective or priority (perhaps the Taliban have grown sufficiently bothersome to Pakistan that it was willing to make concessions to both the US and India), a very powerful (but discreet) carrot offered by the US and/or India, or simply a reduction in terms/needs on both sides (the US and India may be willing to tolerate and even quietly support a Pakistan-approved Taliban stakeholder in Afghanistan). Although, frankly, some combination has likely occurred. But that a Great Deal has been struck is becoming all but obvious, even if the terms are not being publicized. They will likely not be publicized for some time. But this deal has led to a massive (and likely sustained) disruption of Taliban leadership; coupled with the Marjah offensive (and others like it, similarly supported by Pakistani intelligence), the Taliban is likely to take a series of critical blows to its warfighting and governance capabilities. Fourth, and perhaps most importantly: negotiations. My goodness, they are everywhere, they are involving everybody, and they are sudden. Players as far-flung as China are at the negotiating tables with various elements of the Taliban, trying to win over some groups and isolate others. These negotiations will be difficult, as all the players have different wishes, different areas of competition, and different carrots to offer, and the more intelligent elements of the Taliban will play them off each other. But there is a unified drive that gives the negotiations hope: the aim is to "strike while the iron is hot" and bust up the Taliban--the disruption of its leadership, the renewed and surprisingly public cooperation between the US and Pakistan, and the very visibly victorious offensives by NATO and the Afghan Army are all meant to send a message: the Taliban has passed its peak of power in the AfPak region, the Surge is here to stay, and to win, Pakistan is no longer a safe haven, life is only going to get worse, the time to negotiate is now. Becuase different elements of the Taliban also have varied interests and different tolerance levels for war and mayhem, these negotiations aim to get the right elements to break away towards cooperation with NATO-led forces (spelling the doom of the die-hards). And now, I'm going to ride on my reputation a bit and make a prediction. In many previous posts (that should be a cleverly-placed set of links, but I am too lazy at the moment to dig them up), I predicted that Afghanistan would continue to be a quagmire, and continue to be essentially unwinnable until the United States was able to garner Pakistan's support and cooperation. I will now predict that, now that NATO and Pakistan are working together, the advantage has shifted. What sort of victory can be won is as of yet unclear, but over the next few years, Taliban influence in both Afghanistan and Pakistan is likely to decrease significantly, and some elements of the Taliban will certainly break to cooperate with NATO/Afghanistan/Pakistan in hopes of cashing in on carrots being offered (rather than suffering the sticks that the combined forces are capable of delivering). What frustration. Certainly I was pretty geared up for the 2009 parliamentary elections in Israel, hoping Kadima would hang on to power, allowing Livni and Abbas to ride off together into the sunset and create the Palestinian state. In retrospect, this was pretty optimistic, and I don't just mean that Kadima lost power to Likud. It probably wouldn't have worked out all that well even if Kadima had taken power, as Palestine still seems to not be in a place where it can run a respectable state, especially in Gaza. So, first thing's first: the Middle East will be a nasty and inhospitable place for US interests until Palestine gets its own state, period. And yes, I understand that such a goal is highly complex and wrought with problems, many of which are directly the faults of the Palestinian people. But ultimately, it is in the interest of the US and Israel alike to have a Palestinian state with a healthy economy. If I had my druthers (and I rarely do), we could hand Gaza to the Egyptians and merge Palestine and Jordan back into Trans-Jordan and make it the problem of some already-relatively-stable governments to keep a lid on Palestine, but that's not going to happen. But an independent Palestinian state (and one that, in particular, is content with its borders, which is going to be pretty tough to come by) will mean relative security for its people, and a situation in which aggression on border issues or whatnot with Israel would make life sufficiently worse as to not be worth it. Palestine, as a stable and economically viable state, would have nothing-to-gain-and-everything-to-lose by fighting with Israel, and would therefore have a strong interest in keeping a tighter lid on its more fanatical rocket manufacturers. And this last decade looked like we were making pretty good progress! The election of Abbas, who should have been seen as a godsend to the West, gave the distinct impression that the Palestinian people were tired of intifadas and ready to sit down, talk, draw some lines on the map, and move on with their lives. The moderate Labor party in Israel showed similar promise. Both sides looked ready to take the risks necessary (and probably suffer through the ensuing pain necessary) to get to that key treaty that we've all been waiting for. But what the heck happened? The big clincher was probably the Olmert scandal. His loss of moral authority castrated him from being able to drive the necessary treaties through parliament; serious delays popped up. By the time Livni was in a position to do the negotiating, Obama had been elected and the Palestinians wanted to wait around for him (perhaps hoping to gain a strategic advantage from losing an American president that they perceived to be pro-Israel). The elections came, Netanyahu won, settlement-building ramped up, and everybody got very angry at each other again. Not, of course, that the war in Gaza helped things any--had Israel successfully "dismantled" Hamas, life might be a bit different. But in failing to do so, they were left with only a battered reputation. At this point, Netanyahu is barely humoring the idea of an independent Palestinian state: he wants it to be fully demilitarized, and wants Israeli settlements to grow into the West Bank "naturally," with the population (and has not made it clear as to what would happen to those settlements if a Palestinian state gets built). Further, he's insisting that all of Jerusalem would stay in Israel. It's a tough stance to negotiate with, even for Abbas. Perhaps the strategy is to try to squeeze more to the Israeli side in a compromise, but at some point, one's demands are so high that the other side is incentivized to walk away from the negotiating table at all. And so I think that Israel and Palestine are now significantly farther from where they were in, say, 2007, as far as being close enough in official policy to negotiate a compromise and create a Palestinian state. The moderates made key mistakes that blew their opportunities to make serious headway in the 2000s, and they will probably have to wait through another relatively painful cycle before they can make another reach for some sort of steady-state solution.